One afternoon while I washed the dishes for lunch, my toddler son decided to read books by himself. He ran over to the bookshelf, selected a book and then ran outside to sit on the glider bench to read. When he finished with the first, he tossed it on the floor and ran inside for another. So cute! My preschool daughter draws pictures every day. Drawing and creating is one of her favorite things to do. 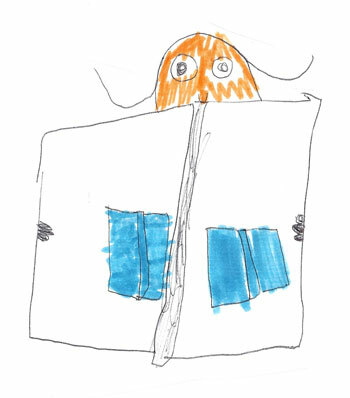 This is one she is very proud of and suitably titled, "A Girl Reading a Book." We read together often and it shows! 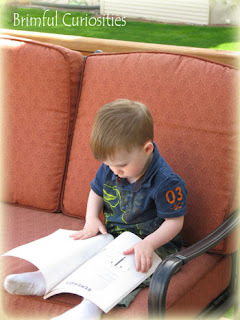 That is so fantastic to learn a love of reading so young! My little man loves to "read" to Isabella! The picture of your son is adorable! And the drawing is quite impressive! I like that the book even shows a spine and a bit of 3-d perspective. Very talented! I LOVE to see kids reading! My children always seem to have a book in their hand!!!! Keep reading! Keep drawing! Love it! Love it! The photo and your daughter's art work. Happy WW! That is so wonderful that your children love to read. Cute pictures! that is so adorable. i love the drawing. Love it all! Your pictures are so adorable! Those activities are two of my children's favorite things to do too. My oldest loves to draw. That is such an adorable picture. The drawing is quite cute as well. I love the drawing! I have a super crafty little 9yrold and she amazes me.. you've given me an idea .. maybe I'll record my 6yrold reading, he's just come over the reading hump and it's sooo fun to watch him read! What wonderful pictures!!!! I remember when my oldest was little and decided he needed to read the newspaper with a cup of tea next to him.... kids are so funny! Tell your daughter her drawing is BEAUTIFUL! Both are beautiful pictures. I have a granddaughter who visits and the first thing she does is gets the books from her shelves at my house she's going to read to me. She's 4. I love seeing pics like this. Makes the future look brighter. I love it! What great pictures! It's so great to see them interested in reading. Love it! That is too cute! And it's great that he's interested in books.